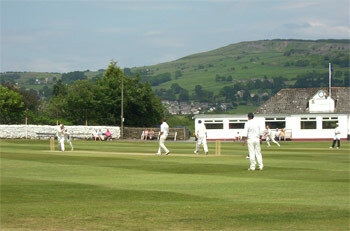 Steeton Cricket Club is a village cricket club playing in the Airedale-Wharfedale (A&W) cricket leagues. It has existed since 1868 and has owned and played at the Summerhill Lane ground since 1948. Over the years the pavilion has seen several changes and in 2012-13 it underwent its most extensive structural alterations funded by grants from Sports England, The Veolia Environmental Trust, Wren and 'Awards for All', together with an interest free ECB loan secured through and supported by partnership working with the YCB Cricket Development management team. All of which helped the Club provide much improved facilities to increase cricket participation within the local community. The Club also contributed a substantial amount to the project in terms of money and members efforts in organising local fund-raising events over the period leading up to the scheme. As a result, a new pitched roof was installed which completely covers the entire pavilion with further enhancements also carried out comprising an enlargement of the existing changing room facilities, the addition of a girl’s changing room and better disabled access and facilities for members and visitors. The first matches played were in 1950 and the Club was subsequently elected to the A&W leagues to start playing in the 1954 season. Over the years the Club has had mixed success in the very competitive leagues but continues to field three senior teams with the third XI providing for young players to take their first steps into senior cricket. The main objective of the Club however is to develop young cricketers and give them the opportunity to enjoy cricket and play a role in the continued development of the cricket and social environment of the Club. Steeton CC was given Focus Club status in 2009, part of the criteria of which is to be ClubMark registered (attained in 2007 and since re-accredited until 2018), and has achieved recognition for the work put in by the Club, the coaches and the players who helped to create a properly structured and safe junior development programme. The Club currently has teams which play in the Upper Airedale Junior Cricket Association leagues at five age groups between u9's and u17's and looks to encourage junior players to respond to the coaching programme and the opportunities within the Club to enjoy cricket, if possible progress to representative cricket and to continue playing in senior cricket. The junior players are the future of the Club. Importantly, the Club has robust Child Welfare Policy, Health & Safety Policy and Sports Equity Policy, compliant with the ECB guidelines. All policies have been adopted from the ECB ‘Safe Hands – Cricket’s Policy for Safeguarding Children’. As with many clubs, Steeton CC relies on volunteers and we are very keen for parents and members of the local community to engage and become involved to increase membership levels and provide parental assistance and volunteer participation within the Club.